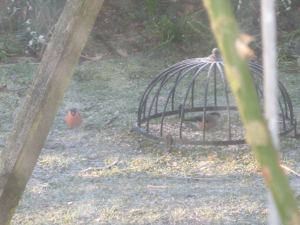 Observation - bullfinches - UK and Ireland. Description: male outside feeding cage and female inside.Haven't seen any in the garden in 15 years before this winter, though seen in nearby hedges before. male outside feeding cage and female inside.Haven't seen any in the garden in 15 years before this winter, though seen in nearby hedges before.